American-built civilian store-dump communications satellite. Aprize's satellites were miniature spacecraft designed and optimized for data relay with very low power consumption. 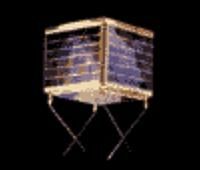 Communication satellite built by SpaceQuest for LatinSat (Aprize Argentina) (LatinSat A-D); AprizeSat (AprizeSat 1-6); exactEarth (AprizeSat 5, 6, 7), Argentina. Launched 2002 - 2014. AKA: LatinSat. Status: Operational 2002. First Launch: 2002-12-20. Last Launch: 2014-06-19. Number: 12 . Gross mass: 12 kg (26 lb). Excluding antennas, each satellite was a cube only 20 cm on a side and weighing less than 12 kg. Each satellite contained ten radio receivers, two agile transmitters and up to twelve megabytes of solid-state data storage. Only one watt of power was needed to power the satellite. Aprize Satellite's proprietary spacecraft design reduced the construction and launch cost for a Little LEO satellite constellation by almost an order of magnitude. While others had an estimated cost of $350 to $600 million for the construction and launch of a Little LEO constellation of 24 to 48 satellites, Aprize could deploy a comparable system for $60 million. This significant cost reduction was the direct result of a unique system architecture that eliminated the need for an active satellite attitude control system using thrusters. The initial Aprize system was to include six communication satellites in low-Earth orbits. These satellites circled the earth 14 times each day, receiving data signals from all the active user equipment, and polling those from which data was specifically requested. 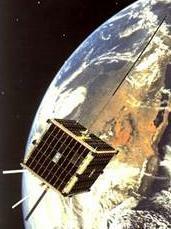 Each satellite stored the data it received until a Regional Satellite Node (RSN) was within view, at which time the satellite transmitted the data to the RSN. After the data relay market was sufficiently developed, up to 42 more satellites were to be deployed into similar orbits. These additional satellites would increase the data relay capacity, system redundancy and global coverage. The radios used for communications operated in the UHF frequency band authorized by the International Telecommunications Union (ITU) for Non-Voice, Non-Geostationary Mobile Satellite Services (NVNG MSS). The small physical size of a spacecraft limited the amount of power generation possible with a the limited solar panel area. Through the use of high-efficiency Gallium Arsenide solar panels, low-power circuit designs and microelectronic components, Aprize was able to reduce the total power consumption of the spacecraft bus to less than one watt. By operating the satellite's high-power transmitter only during those times when it was actually communicating with User Terminals, it was possible to extract the needed power from six nickel cadmium batteries, and then recharge the batteries during the non-operating portion of the satellite's orbit. Using this strategy, each satellite could collect data from more than 100,000 worldwide User Terminals daily. Family: Civilian comsat store-dump, Communications. Country: USA. Launch Vehicles: R-36M 15A14, Dnepr. Launch Sites: Baikonur, Baikonur LC109. Agency: Aprize. Bibliography: 2, 552, 554, 6349, 12054.